This Layla mattress review explains the benefits of the copper-infused Layla memory foam mattress Most people associate the name Layla with Eric Clapton’s song about Beatle George Harrison’s wife Pattie Boyd, who Clapton eventually married in 1979 after her 1977 divorce from George Harrison. However, a Layla mattress will be more enduring than either of those marriages. Why is that? Because it is constructed on sound foundations and also offers something unique: a fusion of modern foam technology and intelligent design. The modern foam is memory foam, and the intelligent design involves the use of copper to conduct away the heat generated while you sleep. Add a Lifetime Warranty to that and you have a marriage of innovations that are not only unique but are long lasting. Let’s have a close look at the Layla mattress and some of the features that enamors it so much to those that use it. 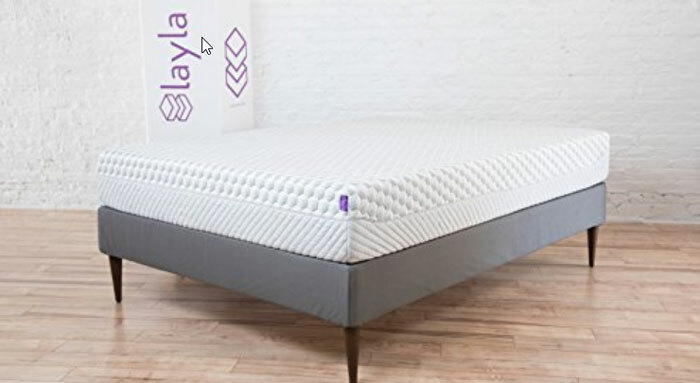 We shall start our Layla review with the construction since most people like to know how their mattress is made and how the different layers work together to keep them comfortable during the night. The Layla mattress is 100% foam with no springs. It is a double-sided mattress where each side offers its own properties. Here are the layers that make the Layla bed what it is. Because this mattress is double-sided, each side is constructed differently. The Cover: The Layla cover is made using a soft polyester infused with a gel that helps to keep the mattress cool at night. It is zippered and can be removed for dry cleaning. The cover encloses the entire mattress – the soft and the hard side. The Soft Side: The soft side of the mattress has 3-inches of copper-infused memory foam on top. The memory foam is 3.5 lb density. Memory foam is known to become hot during use, and that is why is the highly conductive copper is used to draw that heat away. The Transition Layer: Beneath the 3 inches of memory foam is a 2-inch layer of polyurethane foam. This has a density of 1.8 lb. It provides a transition between the soft comfort layer and the support of the firm core beneath it. This 2-inch layer is of a convoluted egg crate design. The egg crate design allows air to flow within the mattress and reduce its overall temperature. The Support Layer: This is crafted from high-density 2 lb polyurethane foam. This layer responds to pressure rapidly and provides a good base for the entire mattress when placed soft side up. Firm Side Comfort Layer: The comfort layer on the firm side is a 1-inch layer of copper infused 3.5 lb memory foam. Because the memory foam is just one inch thick, you will not sink into it in the same as with the other side. That makes it feel firmer when this side of the mattress is up. Another reason for it feeling firmer this side up is that there is no transition layer between the support and comfort layers. As we have explained, the Layla mattress is designed to be softer on one side than on the other. It is fundamentally two mattresses in one! If we take 5 as being average between 0 and 10, then the soft side of the Layla mattress would score 3-4 and the support side at around 7-8. It is neither very soft nor very hard. The pressure relief offered by both sides of the Layla memory foam mattress means that it is an excellent choice if you suffer from back pain or pain in your joints: hips, knees and even your neck in many cases. If you combine the benefits of the Layla mattress with a memory foam pillow, your neck and spine should be oriented in a straight line when you sleep. This is true whatever side of the mattress you choose to sleep on. Memory foam is suitable for most sleeping positions. As mentioned earlier, the properties of this type of foam is to absorb the pressure of your shoulders, hips, knees while also supporting your lower back. Here is how the Layla mattress performs for different sleeping positions. It should be noted that your body weight is also a factor, and heavier people may require a denser foam than lighter weight people prefer. Back Sleepers: The softer side of the Layla mattress is ideal for those that sleep on their back. The extra thickness of memory foam on this side (3″ on the soft side and just 1″ on the harder side) conforms to the natural curvature of your spine and supports the back naturally from the shoulders right down to the base. You will suffer far fewer back problems when you sleep with a natural alignment of your spine. Side Sleepers: Again, the thicker layer of memory foam comfortably supports your pressure points: the pressure exerted on your shoulders, hips, and knees. Keep in mind that when you sleep on your side, your body weight is supported by a smaller area of your body than if you sleep on your back or stomach. Stomach Sleepers: The softer side of the Layla mattress is less suitable for those who sleep on their stomach. In this case, the natural curve of your lower back will tend to straighten out as your hips and chest sink into the mattress. Stomach sleepers are best to use the firmer side of the mattress. While most orthopedic surgeons and chiropractors do not recommend sleeping on your stomach, the firm side of the Layla mattress helps to prevent these issues. Edge Support: While discussing your sleeping position, it may also be appropriate here to also discuss edge support. This is another important aspect of a mattress. With this mattress, you get no sensation of falling off the bed when you get near the edge. That’s because the transition and support layers offer excellent support right up to the edge of the mattress. Sure, when you sit on the edge of the mattress it will give, but not so much that you feel you are not being supported. Cooling Properties: Copper is a highly conductive metal, and when in contact with your skin it conducts the heat away into the foam. It then dissipates throughout the foam, rather than creating hot spots. This helps you feel cooler when in bed. Kills Microbes and Fungi: Copper possesses antimicrobial and antifungal properties. It kills off bacteria, viruses, fungi, and molds and helps to keep you healthy while you sleep. Firms Up Support: Once the memory foam you are lying on compresses, the copper particles compress against each other and provide extra support for your pressure points. This helps to firm up the support you need for certain areas of your body such as your hips and shoulders where extra support may be needed. Improves Your Health and Wellbeing: Copper bracelets are worn by many people with arthritis, and to help avoid certain types of illness. It is believed that copper releases positive ions that interact with their body to help keep their blood circulation running well and reduce stiffness in their joints. Of those four benefits of copper-infused foam, the cooling benefits are the most important and why people like the Layla mattress. The others are relevant in the order given, from its antimicrobial properties down. The ‘Health and Wellbeing’ properties are the least attractive to most people, although if you believe that copper can help you in this way, then that is a good reason for using this mattress. The Layla mattress offers excellent movement separation and isolation properties, largely due to the memory foam. One partner is very rarely disturbed by the other when they move in bed. Even when you get into bed, or get out during the night for whatever reason, you will tend not to disturb your partner. Of course, that comes with a negative: the mattress has very little bounce properties, and younger couples will likely prefer the harder side to the softer that tends to hold you into the bed. The Layla mattress has many benefits for most people, but it also has some negatives. Here we shall list the Pros and Cons of the Layla bed, and then answer some of the questions we get asked about it. Two sides to the Layla mattress, one soft and one harder. You can choose which you prefer to use. Memory foam used in its construction, offering relief to those with orthopedic issues and back pain. Suitable for all sleeping positions: Back, Front and Side Sleepers. Copper infused foam to keep it cool and kill off microbes, viruses, and molds. Lifetime Warranty offered for manufacturing defects. 120-night sleep trial: return it within four months for no-question refund. The cover is infused with Thermo-Gel, dispersing heat and helping you stay cool at night. Cover removable and can be dry cleaned. Spare covers available to purchase. Available in Twin, Twin XL, Full, Queen, King and Cal King sizes. Cannot be flipped other than to change the level of hardness. So if you prefer the soft side or vice versa, you can turn it but not flip it. As you can see, there are very few negatives to the Layla memory foam mattress. During the compilation of this Layla review, we have been asked a number of questions. Here some of the more common Layla Mattress FAQs we have answered. 1. Does the copper in the Layla Mattress make much difference? Yes, it does! Copper is highly conductive, which means it can conduct heat away from you and your bed, and so keep you cooler at night. Not just that, but copper is antimicrobial. It can kill bacteria and viruses, and also molds. Sleeping on a Layla mattress will, therefore, keep you healthy at night. 2. Will the Layla mattress be suitable for an adjustable frame or base? Yes, it is. Many people use an adjustable base with a Layla mattress: whether that is an adjustable wooden base or a metal frame. 3. Is the Layla Mattress Fire Resistant? Yes – absolutely! It has a Ventex blocking sleeve of 48% Fire Resistant rayon, and 52% Fire Resistant rayon polyester. This fire-blocking system uses no hazardous chemicals – just fire-blocking elements within the structure of the fabric. 4. How much does the Layla Mattress weigh? The weight depends on the size, obviously. It ranges from 50 lb for the Twin to a maximum of 90 lb for the King and Cal King. 5. How does the sleep trial work? Easy! Sleep on that mattress for at least two weeks and a maximum of 120 nights. If you don’t like the mattress between that 14 night and 120 night window, return it for a full refund. There will be no charge to you – no return fees, shipping fees or restocking fees. The returned mattress will be donated to a local charity. 6. Can In use a mattress protector with this mattress? Yes, of course, you can. ; However, be aware that this may affect the cooling properties of the foam. 7. Can I was the mattress cover in my washing machine? NO! The cover can be dry cleaned only. If you wash it you may void the warranty. If you need extra covers, they are available to purchase. 8. Is the Layla mattress really made in the USA, or are parts made outside of it? The entire mattress is designed and manufactures in the USA: It is assembled in Arizona from foams prepared in California and Georgia. The label and cover are made in North Carolina. Sometimes, when we are very busy, we will send our fabric down to Mexico or El Salvador for cutting and sewing in order to avoid being late with your order. 9. What types of foam are used in the Layla mattress? If you read our Layla review you will find out that each outer layer consists of a high density memory foam infused with copper (one of 3″ and the other of 1″ thickness), the air-flow transition layer is convoluted polyurethane foam and the support layer consists of high density polyurethane foam. Note: Polyurethane foam is commonly referred to as ‘poly foam’. The support layer is next to the 1″ high density memory foam layer. The transition layer lies between the support and 3″ memory foam layers. 10. Does Layla make a pillow with copper, the same as the mattress? That’s easy to answer: Yes it does. The Layla mattress is unique in that it contains copper infused into the memory foams, and in that each side has different densities. There is a soft and a harder side, and between them, they should meet the needs of most people. Any Layla bed review will comment on the versatility of this mattress. Our FAQ section should answer most questions that you may have about the Layla mattress.